Can you suggest a skin whitening cream that does not contain steroids? 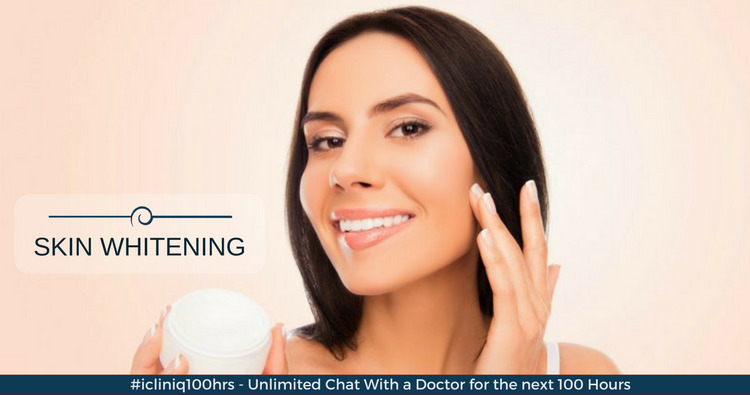 iCliniq › Ask a doctor online › Answers › Dermatology › Dull Skin › Can you suggest a skin whitening cream that does not contain steroids? Q. Can you suggest a skin whitening cream that does not contain steroids? I am a 27 year old female. My skin appears very dull. Can you suggest a whitening cream that does not contain steroid, which I can use on a regular basis? • Is there any solution to make my face match my body color? You can take an oral Vitamin C supplement every day. I suggest taking one sachet of Ener-C 1000 mg in a glass of water. Apply Golite skin lightening cream over the face at bedtime. Thanks for your reply. Can Ener-C be used on a long-term? For how many months can I use it? Are there any side effects I can expect? I am a lactating mother. Vitamin C is good for the skin and it reduces pigmentation. Ener-c is a Vitamin C supplement. You must dissolve it in a glass of water and then drink it. You can take it for two months, maybe even more if required. There are no side effects of the same and does not affect lactation. Thanks for replying. Should I use sunscreen with SPF 40 or 50? Can Golite cream be used safely for long periods without any side effects? Can I expect visible results within days of using this cream? Use sunscreen with an SPF 50 in the morning. Golite cream can be used for three to four months at bedtime. It is a non-steroid, non-hydroquinone based cream and hence safe without any side effects. Any topical application of creams should be changed after six months. You will notice less pigmentation in 30 to 45 days after you start using this cream. Thanks for replying. Does St.Dalfour whitening cream have any side effects? About two years ago, I used Melacare skin whitening cream with good results. But, I stopped using it as it contains steroids. St.Dalfour whitening cream is not a medicated cream. Its contents are not mentioned anywhere. Melacare cream contains steroids. In the case of steroid-based creams, there are quick results and visible lightening of the skin. But, it is due to the thinning of the skin. So, I do not personally suggest the use of creams that contain Steroids and Hydroquinone.